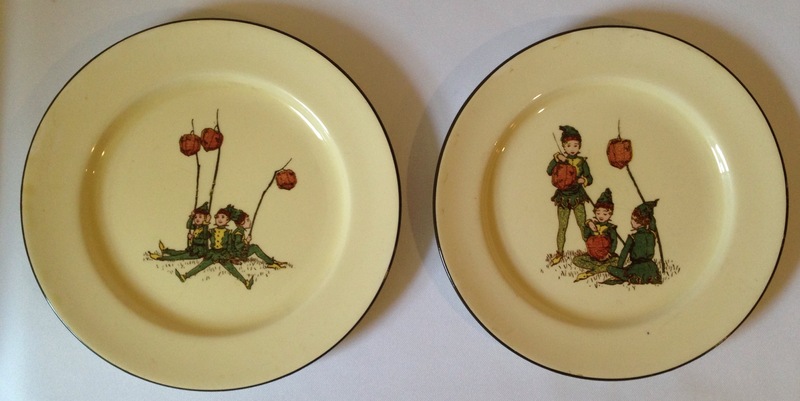 Doulton’s rare seriesware pattern Pixies. For me this is one of the most endearing patterns that can be found on seriesware and it really does take you back to a different time – when fairies, pixies and gnomes were all the fashion and captured our imaginations. There are two pattern numbers recorded – D3690 and D3747. I have seen the plate on the right (D3690) in different colours and the design on the left (D3747) on a baby bowl – other than these examples, I have never come across any others, so I imagine it to be rare. This charming series was introduced in 1913 and apparently withdrawn by 1930.